Ringed by perfect beaches, clear waters and coral reefs, these three tiny islands off northwest Lombok have come to define the perfect holiday escape. Throughout the 1980s and 1990s the deep water coral reefs, miles of white-sand beaches and slow pace of life attracted backpackers to the three Gili Islands. Today, the islands feature stylish resorts as well as the original backpacker accommodations. 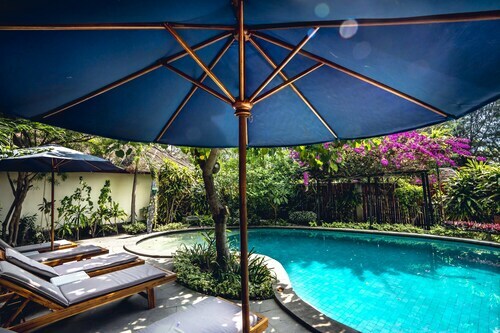 The area has matured into a world-class destination while still managing to maintain innocence and simplicity. 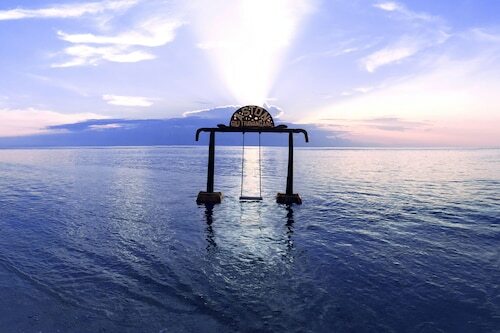 The three islands that make up the Gili archipelago are Gili Trawangan, Gili Meno and Gili Air. Although they are very close to each other, each has developed its own distinctive characteristics. The island closest to Lombok is Gili Air. Pull on a face mask and fins and simply swim out from the beach here to explore fabulous coral reefs. Visibility is often excellent and there is a vast array of marine life to see including reef sharks, manta rays and barracudas. Back on land, say hello to the local chickens, goats and cows. Gili Air is popular for its quaint rural atmosphere. The middle island, Gili Meno, is the smallest and quietest. Visit turtle sanctuaries where green and loggerhead turtle eggs are hatched and nurtured for several months before being released into the ocean. 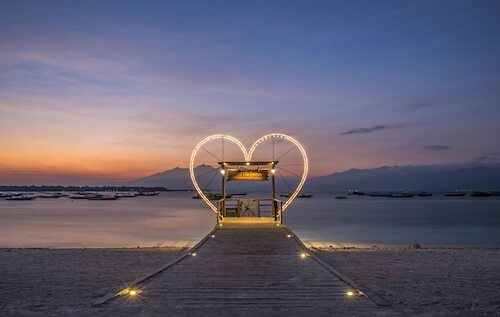 Gili Trawangan is the farthest from the mainland and known as the party island for its lively bar scene and all-night beach parties. 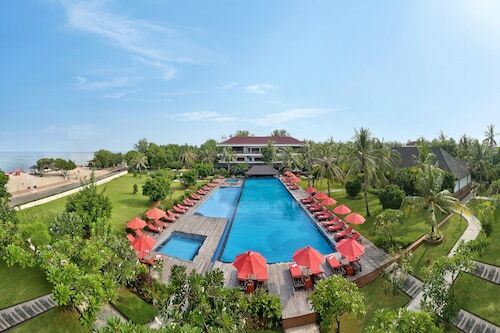 It does, however, have its quieter side too with several luxury hotels and villas. All three Gilis offer good snorkelling and diving opportunities. Find dive operators on any of the islands to rent equipment or arrange a guide. There are no motorized vehicles on any of the islands. Your options for getting around are bicycles, horse-drawn carts known as cidomos and walking. Gili means “small islands”. A leisurely walk around any of the islands takes no more than two hours. To get to the Gili Islands from Lombok you can charter a boat from Bangsal Harbour or Senggigi. Fast speed boats also run directly from Bali. An active volcano, dense forests and seemingly endless stretches of undeveloped coastline make this island a less crowded and more natural alternative to neighbouring Bali. Explore a Buddhist temple that is more than 1,000 years old, and study its highly detailed statues, carvings and reliefs. 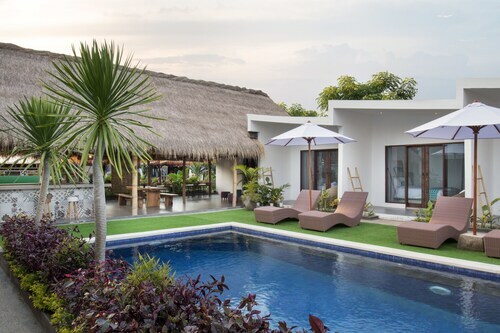 Travel through thick tropical forests, feed families of monkeys and enjoy stunning views over the North Lombok Sea to the Gili Islands and beyond. Jalan Mojo, Gili Air, Nusa Tenggara Bar. 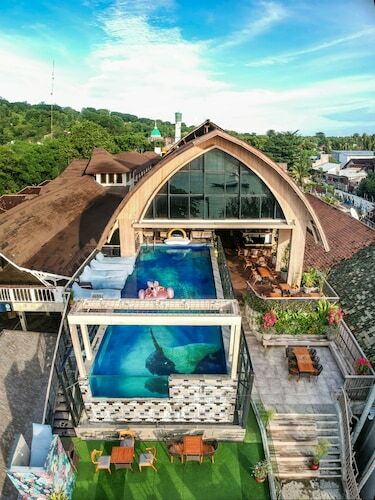 Situated in Gili Air, this hotel is within 3 mi (5 km) of Bangsal Harbor, Gili Meno Bird Park, and Gili Meno Harbor. Gili Meno Turtle Sanctuary is 3.1 mi (5 km) away.